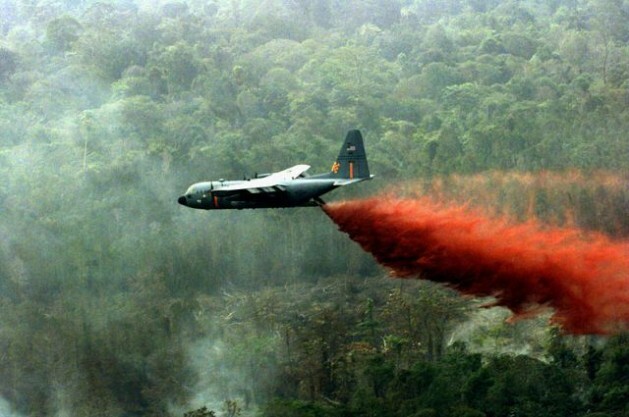 UNITED NATIONS, Jul 10 2013 (IPS) - Indonesia’s forest fires, a predictable annual ritual, will continue to have serious implications for health and the environment in Southeast Asia unless the government strengthens forest protection, warn environmental groups. The government claims it is doing its best, including implementation of existing protection measures against recurring forest fires. But environmental groups say Indonesia’s best is not good enough. Last month’s forest fires in Indonesia, which literally choked parts of Singapore and Malaysia, have revived a longstanding debate on one of the key environmental issues troubling Southeast Asia. The Malaysian government declared a state of emergency in areas where the haze triggered “one of the country’s worst pollution levels”, even as Singapore urged people to stay indoors. Conscious of the ecological implications, Indonesian President Susilo Bambang Yudhoyono formally apologised to Singapore and Malaysia for the widespread pollution caused by the forest fires in his country. “For what is happening, as the president, I apologise to our brothers in Singapore and Malaysia,” Yudhoyono said. Indonesia has been working hard to fight the fires, which are mostly set by farmers to clear fields. Ironically, the Indonesian president is one of three world leaders – along with Britain’s David Cameron and Liberia’s Ellen Johnson Sirleaf – chairing a high-level panel on the U.N.’s post-2015 development agenda, which places high priority on the environment, and specifically on a set of future sustainable development goals. As a result, says one Asian diplomat, neither the United Nations nor Secretary-General Ban Ki-moon are likely to take a critical stand on Indonesia’s continuing forest fires. “It’s a politically sensitive issue,” he told IPS, speaking on condition of anonymity. Asked for a response, U.N. spokesman Martin Nesirky told reporters Tuesday: “Well, as I understand it, the countries in the region are closely coordinating and cooperating on this particular matter. And I think I would leave it at that. “Should I have further information, particularly from my colleagues from the Economic and Social Commission for Asia Pacific (ESCAP), then I’d let you know,” he added. Their commitment to cut greenhouse gas (GHG) emissions up to 41 percent will be a mission impossible (most of the carbon emission is contribution of deforestation and land use change in the forestry sector which contributes up to 80 percent of Indonesia’s emission), he said. “Forest governance, which includes law enforcement, is very weak. Even Indonesia has adopted zero burning policy (under the Forestry Act, Plantation Act and Environmental Protection and Management Act) but it is clearly still occurring on a widespread scale,” he added. He also said investment in forest protection itself is also very low in terms of human resources – forest firefighters, forest fire investigators, equipment, early warning system – and it means that this environmental crime is allowed to occur. Corruption also part of the problem in the land-based extractives industry, such as plantations, forestry and mining, he added. Pieter van Lierop, Forestry Officer (fire management) at the Rome-based Food and Agriculture Organization (FAO), told IPS it is important to recognise that fire is used as a land management tool. However, fires that get out of control on drained peatlands frequently cause significant damage to human health, human assets and biodiversity and create large amounts of greenhouse gasses contributing to climate change. The risk of such fires and their emissions are very high as dried peat becomes extremely inflammable and fires can remain underground in the peat for some time and then rise to the surface at a considerable distance from the original outbreak, he said. Nazir Foead, conservation director at the World Wide Fund for Nature (WWF) Indonesia, told IPS the implications for Indonesia would be on several fronts. Public health is certainly one of them, mostly for those living in provinces heavily affected by haze, he said. Foead said the state may have to bear some of the costs to improve public health. As the fires burnt either crop or timber plantations, companies and farmers will endure economic losses. “We hope the [Indonesian] government would seriously enforce the zero burning laws on companies, and provide assistance to farmers who would eventually use fires to clear land every year,” he said. If farmers are not provided with technical and financial assistance, they will start the fires again next year, he warned. FAO’s Van Lierop told IPS that commercial enterprises involved in oil palm and other plantations should avoid the use of fire in the establishment and maintenance of plantations. At the same time, he said, small farmers should receive more support to use fires in a controllable and efficient manner and, where possible, to apply alternatives to the use of fire as an agricultural tool. “There is need for a more active exchange of experiences, good practices and knowledge between the different regions of Kalimantan and Sumatra (where forest fires occur),” he said. Governments at all levels should play an important role in this. International research projects could also contribute more to the exchange of good practices and the results of research, he added. FAO has been providing support to countries to develop an integrated approach to fire management, from prevention and preparedness to suppression and restoration for many years, he said. Greenpeace’s Indradi told IPS the forest fire problem is part of the wider problem Indonesia has with managing its natural resources, “especially when we continue to put political and financial interests first rather than the environment”.